Most breeding activities occur during the rainy seasons - when their favorite food source - grass seeds - is most abundant. In northern Australia, this is between June and September (winter); and in southern parts between August and January (spring and summer). However, they will breed at any time of the year after heavy rains. They reach reproductive maturity when they are about 180 days old. Throughout their range, Budgies breed in large colonies with nests often being on the same or nearby tree branches about 10 - 16 feet (3 - 5 meters) apart from each other. 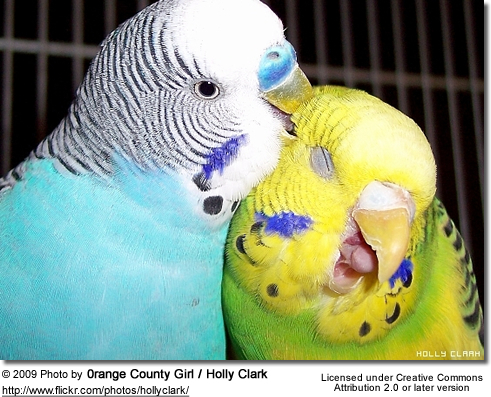 Budgies are generally monogamous, forming bonds with one another that last a lifetime. However, some records of extra-pair copulation exist, when some females mate with males other than their mates. This is thought to occur to get some additional help raising the chicks. Signs of bonding in mated pairs are mutual preening and feeding. The females choose the nest site. These cavity nesters will nest in holes in Eucalyptus trees, fence posts or in hollow logs lying on the ground. The nests are lined with decayed wood dust, droppings, and any other soft material that they find in their environment. The average number of eggs in a clutch is 5 to 6 (or 4 - 8 in captive birds). They can produce two or more clutches a year. The uniformly whitish / pearl-colored eggs are typically 0.4 - 0.8 inches (1 - 2 cm) long. The eggs are laid on alternate days; after the first one was laid, there usually is a two-day gap until the next. Incubation usually starts after laying the second or third egg. Once incubation has commenced, the females only leave their nests for quick meals, some quick stretches and defecations. The males stand guard by the nests and feed the female at the nests' entrance. The males are usually not allowed to enter the nest. Sometimes parents eat their own eggs - this is typically the case when they feel insecure or resources (such as food) aren't readily available. This can, however, develop into a bad habit, at which time, the parents will never be successful breeders. In captivity, these birds should be taken out of a breeding program. The young hatch after about 18 - 21 days of incubation. The hatchlings are blind, naked, unable to lift their head, and totally helpless (a state referred to as "altricial"). The chicks are going to be different sizes, since they were laid at different times. The age difference between the first hatchling and the last can be up to 16 days (depending on the clutch size and beginning of incubation). The first one is generally the largest of all giving it a huge advantage at feeding time. Initially, the young depend on their mothers to keep them fed and warm at all times. Around 9 - 10 days old: The chicks' eyes open and they start to develop feather down. This is also the time when they need to be close-banded (before that time, they are too small and afterwards, the rings won't fit over the feet anymore). Budgie rings are usually 0.6 - 0.17 inches (4.0 - 4.2 mm) in diameter. The window of opportunity to ring budgies is very small. Around 2 weeks old: Feathers are growing in and mutation colors can be identified. In most cases, the males will start to enter the nests to help care for and feed the young. However, some females prevent the male parents from doing so and will take on the sole responsibility of rearing the chicks until they fledge. About 30 + days old: In most cases, chicks fledge at this time. Both parents continue to feed and protect them for some time thereafter. As the chicks grow protective feathers, they can be left on their own for longer periods of time. The young are seen stretching and exercising their wings in preparation of flight. Their loud screeching calls can be heard when they feel threatened in their nest box. They can be heard calling their parents begging for food. About 5 weeks old: The juveniles are ready to fledge (leave the nest), but the parents continue to feed and protect them for some time after. About 6 - 8 weeks old: At this point in time, they are usually completely weaned. The age for fledging and weaning is affected by the number of surviving chicks. The more chicks are in the nest, the less attention and food each one gets - thus their development is either slowed down (if less food) or expedited (if more food). Hand-raised budgies often take slightly longer to wean than parent-raised chicks. They are difficult to handfeed due to their small size and the handfeeding formula may not be as rich as food regurgitated by their parents. It may be too thin, or feedings are less frequent. In most cases, budgie chicks remain with their natural parents to be raised; and they are fairly easily tamed after they have been separated from their parents. Budgies are easy to breed and will accept just about any reasonable-sized nest box - a wide selection of nest boxes are available - nest boxes that can be attached to the outside of a cage or the inside. In cases where many eggs are laid or in case of absent or non-performing males (that are unwilling to help raise the chicks), it may be wise to foster some of the eggs or hatchlings out to another pair. Of course, the foster pair has to be in breeding mode, either laying or incubating stages, or raising young themselves. Eggs and chicks can only be fostered out if their stages coincide with those of the foster parents. Budgerigars can be kept as a single pair as well as pairs in a colony. 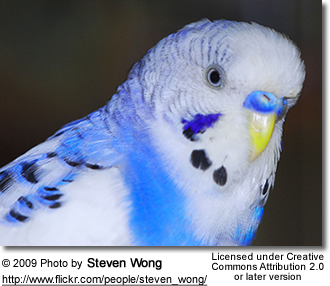 For exhibition or English budgies, it is best to pair them and breed them per pair as you will be required to control the genetics. But if you are not interested in controlled breeding then colony breeding is an option. The minimum cage requirement for a pair of American budgies is: 1.5 feet high by 1.5 feet long by 1.5 feet deep. Exhibition budgies should be housed in cages of the following dimensions: 2 feet length by 1.5 feet high by 2 feet deep. The cage should have a nest box hung in one corner. Direct sunlight must be avoided as it quickly heats up inside the nest box potentially killing the eggs or chicks. 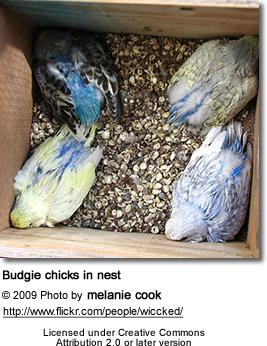 The nest box size used for the English budgies is 6 inches by 6 inches L and Width by 10 inches deep. It is available for breeding lovebird in our local Pakistani market. The cage should have a stick (perch) crossing the front of the box 2 inches below and 3 inches approx. wide of the hole of the nest box. It should be fixed at both the end so that it does not move. I had the budgie pair for three months and despite all my efforts they did not breed. About a month back I introduced a new perched and saw to it that it was very tightly fixed. I was rewarded and the Hen laid eggs. Now they are rearing 7 chicks the older one being about 2 weeks old. So this emphasizes that sometimes the thing may seem trivial but they can have a huge effect on your breeding success. A cuttlefish bone (also known as Samandar Ka jhaag In urdu) should be always available to them plus you can add calcium block if you like. In colony many birds can be kept together but a close eye must be kept on them to see if fighting is going on. If so, it is better to identify and remove the culprit. It usually is a hen who takes fancy to some other hen's nest and the fighting starts between them to conquer the nest box. If colony is handled well then it is more rewarding then the single pair breed. But for beginners I will advise them to keep them a single pair and remove the chicks as soon as they are able to feed themselves. smoking around budgies is that safe? No, it is not safe to smoke around pet birds. They have very delicate respiratory system - far more than humans.